To plan or not to plan…that is the question. There are not a lot of reasons we could say not to plan. It is kind of like housework—you know the plan is going to get messed up quickly. You know that you will not always get it all done and that sometimes you will have to start over. Just like housework, though, homeschooling without a plan degenerates into chaos pretty quickly. However, the benefits far outweigh the negatives. With a lesson plan, you can see what you ideally would like to cover for the year. You can also see how to best integrate subjects. Also, if you have more than one child, you can integrate their classes and see how you can have the older students pair up with the younger and even teach the younger. You can also see if anything is lacking. My oldest daughter is going into Challenge next year, so it is important to confirm if there is anything more I can do to get her ready. Another added benefit is that my oldest now follows her lesson plan for the week and does not have to ask me questions as to what her daily work is. If you are now convinced that you need to do lesson plans, here I shall tell you how I do my lesson plans. I have honed this in the last three years. If you have anything to add or any tips, please add them in my comment section! I make a table in Microsoft Word (if you are good at Excel, you could use that too). On it, I have math, spelling, reading, writing and Essentials of the English language, history, timeline, Latin, English, geography, science, math, presentation, fine arts and science experiment as my columns and Weeks 1-24 as my rows. My goal is to plan out the year in a succinct way. Using this table also eliminates the need for looking through separate pages because I put my EEL work, IEW schedule, and presentation topics for the week on the file. 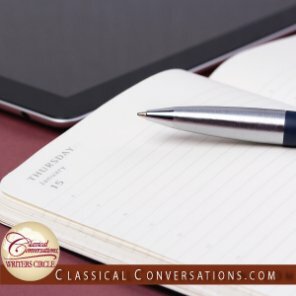 I start with my Classical Conversations topics. You can go through your guide and add your topics each week or I really like Teaching with Boys' Year at a Glance Cycle 2. She has a one- or two- word description for each subject in the week. I then use Half a Hundred Acre Wood's Reading Plans for Cycle 2 to add in the corresponding science and history reading including the timeline cards that correspond to the memory work and any other reading I may want my child to do. This year, I am focusing on us reading aloud as many Challenge A and B books as we are able. I try to pick two or three major books to read per cycle—The Bronze Bow and Number the Stars for Cycle 1, Crispin and The Door in the Wall for Cycle 2, and Amos Fortune and Johnny Tremain for Cycle 3. I then add in the Essentials scope and sequence chart (page 17 or 18 in your Essentials guide). I write the charts to focus on for each week as well as the structure, purpose, and pattern for the week. I then add the Essentials writing schedule and the presentation schedule my daughter’s tutor has given us. I have found the more that I add and the less I have to flip through my papers, the better I can integrate subjects and the better I can plan for the week. Math is the first thing I really have to plan for myself. One of the many reasons I love Classical Conversations is that up to this point, every other thing has been planned for me. All I have done is put it into a table in one place and used some of the work of others to formulate what I want my students to read. We use Saxon for math so on my lesson plan, I specify the lesson number and the concepts covered in Saxon. I have found it is best to plan three lessons for a week. We usually have either a test or an investigation as well each week. If I plan three lessons and we end up getting four done, it is fine. If I plan three and we get two done, it is also fine. Remember, I am just sketching out the year. We still do our math, reading, handwriting, and spelling on our weeks off from CC. I use the end point on my lesson plans as where we’ll aim to be finished during the summer. Finally, I fill in everything else for the year like spelling for both my daughters and handwriting for my youngest daughter. This is the skeleton I use to make sure I am pacing correctly and can integrate well. After this, I make a weekly plan each week. I handwrite this in the same table I use every week. The table for my big girl has the days of the week (Monday through Thursday—we have community day on Friday) at the top of the page and then the subjects Bible, math, spelling, Essentials, writing, current memory work, memory work review (each day has an assigned topic—I got this idea from Brandy at Half-a-Hundred-Acre Wood), reading, Latin, and presentation. Looking at my yearly plan, I quickly am able to divide up all the work for the week. At this point in my planning, I use Sheri Ellis’ amazing notebooking files from CC Connected and print out notebook pages for the week. My oldest likes to write out her memory work and my youngest likes to draw or cut and paste. I print these pages out and then make note of them on the memory work column. I am constantly looking for ways to integrate such as using the prepositions for Cycle 1 as words to read or sort for my younger daughter. I also have both of my daughters look at art related to the medieval period and see where each of the OiLS is. It is September! If you have not done so, let the lesson planning commence!